Colchester New Music presents the Bespoke Brass Ensemble. Don’t miss this evening of SOUND PLUMBING! 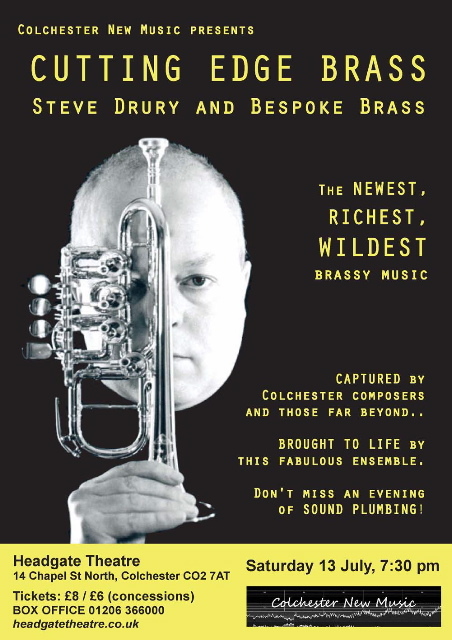 The newest, richest, wildest brassy music – captured by Colchester composers and those far beyond hrought to life by this fabulous ensemble. Over 40 scores were entered for consideration for the programme – from Colchester and East Anglia, other parts of the UK and from as far away as the USA, Canada, France, and Sicily. From these entries, 16 5-minute pieces have been chosen to represent Cutting Edge experiments in Brass Sound, three of them using electronics diffused live in quadraphonic. This entry was posted in Concerts, performance, Previous calls, Upcoming concerts on June 25, 2013 by jennipinnock.